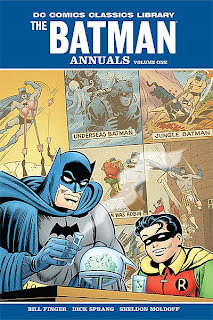 DC Comics Classics Library: Batman - The Annuals HC Now On Sale! Hey fifties Batman fans, apologies for my absence from the blogosphere the past couple of weeks. I have not fallen off of the face of the Earth and will be back to posting reviews of fifties Batman tales tomorrow, beginning with the long delayed finale to Bat-Mite Month (Plus A Few Weeks). And what better way to get the blog back up and running than to remind everyone that the DC Comics Classics Library: Batman - The Annuals HC is now on sale! I get my comics monthly through an online service, so I won't get my copy for a few weeks, but you can guarantee I'll be posting my thoughts as soon as it arrives on my doorstep. Bat-Mite's most well known appearance in animation was on The New Adventures of Batman from 1977. In this cartoon, he hailed from the dimension of Ergo, an interesting addition as his home dimension was never given a name in the comics. Like in the comics, he was Batman's biggest fan and wanted to help him in his fights against crime, but usually ended up doing more harm than good. The biggest change from the comics to the cartoon was Bat-Mite's appearance. He had light green skin with a pink and purple costume featuring an "M" on the chest as opposed to pink skin with a miniature Batman costume with a bolt for the insignia. He was voiced on the cartoon by Lou Scheimer, who also served as executive producer. He was meant to add a bit of comic relief to the cartoon, but most viewers of the cartoon remember this interpretation of Bat-Mite as an annoyance. Bat-Mite made one other animated appearance, albiet a cameo in mechanical form, in an episode of Batman The Animated Series. Hopefully Bat-Mite's upcoming appearance on Batman: The Brave and The Bold will be more well received than that of his New Adventures counterpart.